Do you have an AR15 in stock configuration? Do you want to bring that rifle up to speed with a rail system? 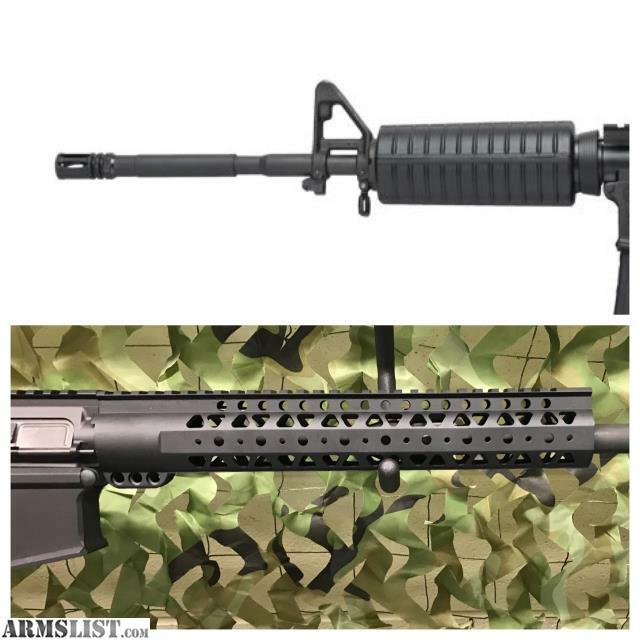 Our experienced gunsmith will remove your handguards, then install a low-profile gas block and Trinity Force free-float handguard system with mounting options for picatinny rail (includes three segments of rail for mounting on sides/bottom of handguard). All of this on your AR15 for $100! This price DOES include the price of the rail! MORE PICTURES OF ANY ITEM UPON REQUEST. We are actively seeking firearms for consignment from a single piece to an entire collection. We pay all fees associated with selling. We have extensive experience in selling all makes and models. Let us do all the work! Contact Matt or Lee today at 828-367-2755. Looking for something, but don't see it listed? Ask us if we can get it! Custom rifle and pistol builds available with full warranties. We are a factory-licensed and insured Cerakote applicator. Multi-State Concealed handgun permit classes offered. Gunsmithing services offered by a competent, experienced technician. We buy, sell, and repair firearms. Found a good deal online? FREE for guns purchased on ArmsList. Veteran/EMT/LEO discounts on all items in shop. 4% surcharge for CC gun purchases. We are the BEST core gun shop in town.